Where my love of birds, nature, photography, art and poetry combine. 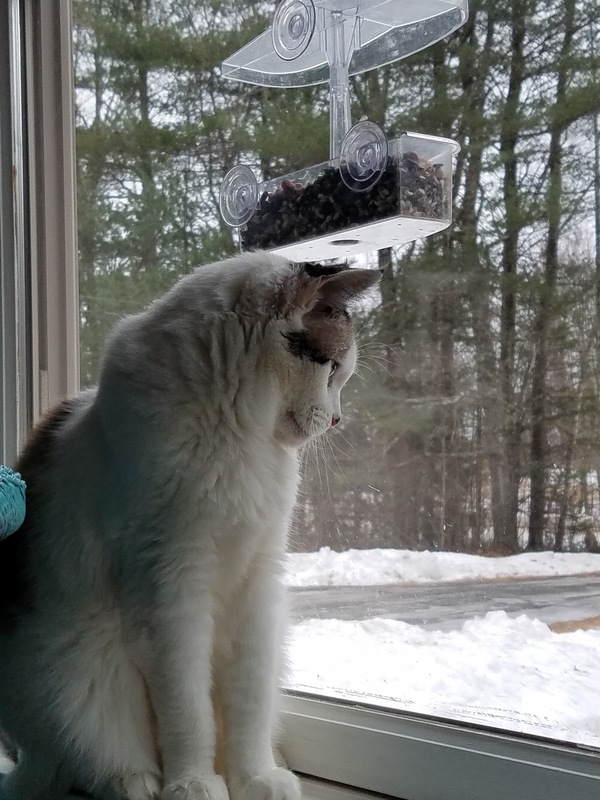 On this gray winter's morning I sit here awaiting the next winter storm. We have been in a pattern of snow, warming rain, melt the snow, deep freeze, then warm and snow again. Today, a winter storm is expected to arrive in about an hour or two. Then I will be stuck inside until the roads clear, but more stormy weather is on the way, with only 1 clear day expected in the next seven. 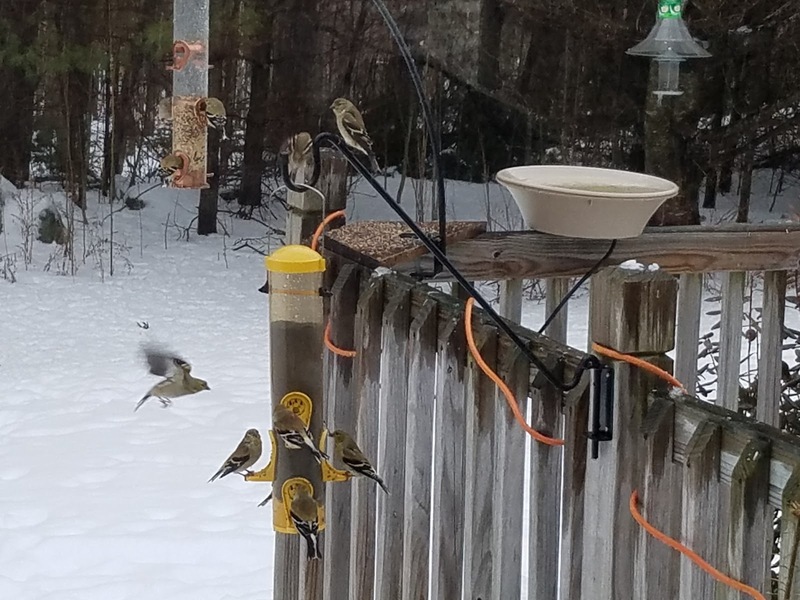 My yard is full of birds at the moment. 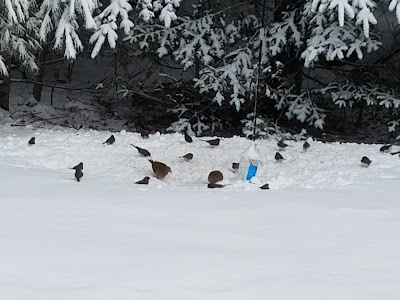 They are in a feeding frenzy before the snow arrives. A Cooper's Hawk has found my feeders and now stops by on a regular basis. Yesterday as I stepped out on the deck to keep an eye on our new puppy I caught movement overhead and saw the hawk land in a tall pine. It must not have seen me as it dropped. I saw the look of astonishment on its face as it saw me instead of birds below, and it quickly took flight. 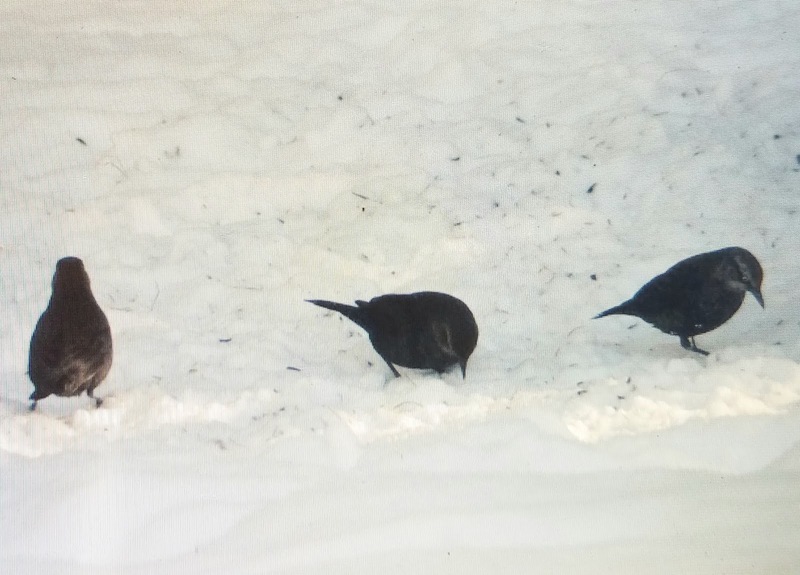 This morning when I was out filling feeders before the snow arrives I heard the hoarse croaking of a raven and looked up just in time to see a magnificent pair flying low over my yard. Their wings made such a rushing sound as they swooped by that I could just imagine their dark wings brushing my upturned face. I watched as they flew in unison, diving and soaring up and over the pine treed border of my yard. Since moving into this house last April I have counted 93 Species of birds. This yard has surpassed all my other Yard Lists except Mere Point at 117 species, and my Jefferson, Maine Yard at 109 Species. But, I lived at Mere Point for 18 months and in Jefferson for a full year. I have only been here for 10 months. Being near the water, as I was in the two previously mentioned yards, has its advantage, but being in the woods has its advantage as well. I picked up a lot of warblers in this yard, as well as migrating thrushes. 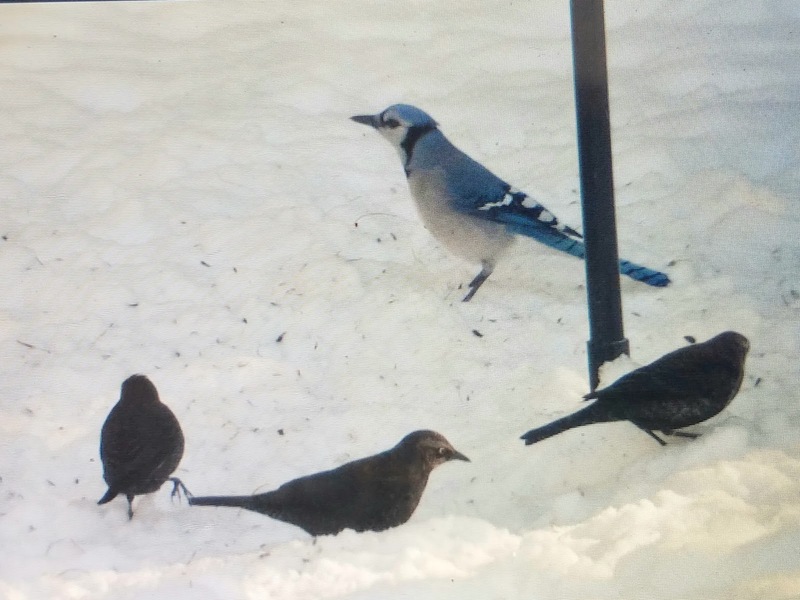 Some of the most unusual sightings I have had in this yard are a migrating flock of Glossy Ibisies last spring, a migrating Snowy Owl on a stormy day last November, three Rusty Blackbirds that showed up in my yard this January, and a recent sighting of a White-winged Crossbill during a snowstorm last week! Rusty Blackbirds have dropped in population by 90% since the middle of the 1900's. These have become rare birds to see at anytime of the year. To have three show up in my yard is just amazing to me. You can learn more about the birds by clicking on the links at the end of this post. A Northern Cardinal with dark-eyed juncos beneath one of my backyard feeders. 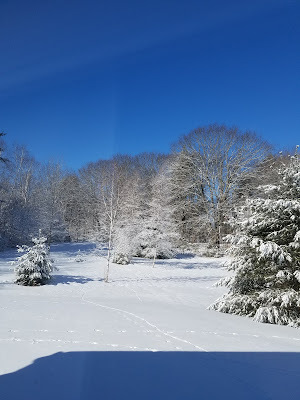 Of course, we had a big snow storm on Ground Hog Day, because, why wouldn't you? That is when the White-winged Crossbill showed up. The goldfinches are fickle. 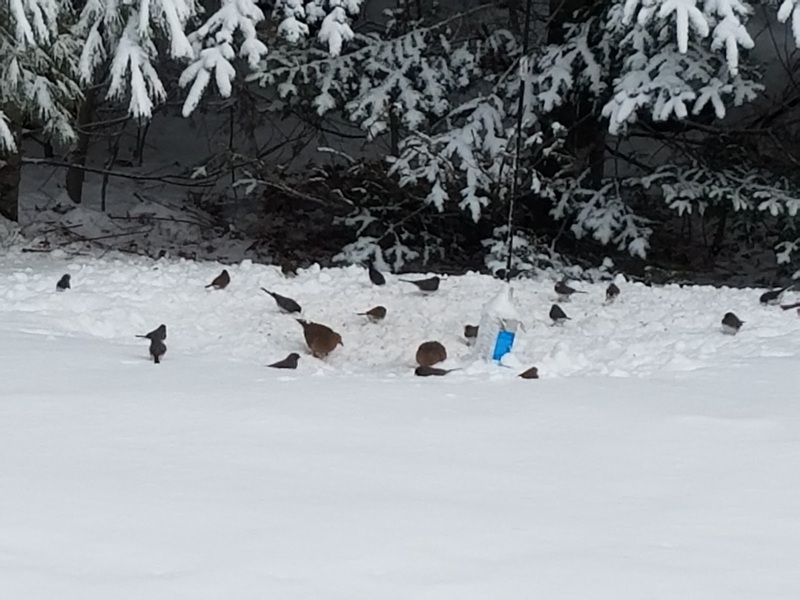 sometimes I have 20 to 30 f them in my yard, and sometimes only 1 or 2. 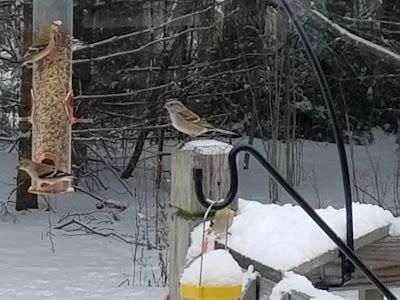 As for the other finches, I have only seen a Pine Siskin once last July, and I have yet to see a Common Redpoll here, or a Pine Grosbeak, despite having almost 20 acres of pine trees! 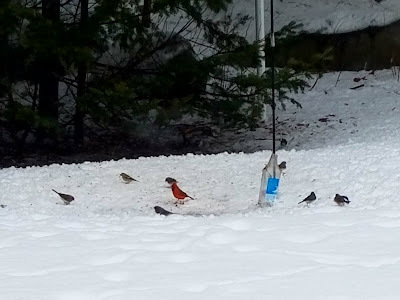 I had Purple Finches all summer, but no House Finches. My yard after the February 2nd storm. We have recently added a new member to our family. 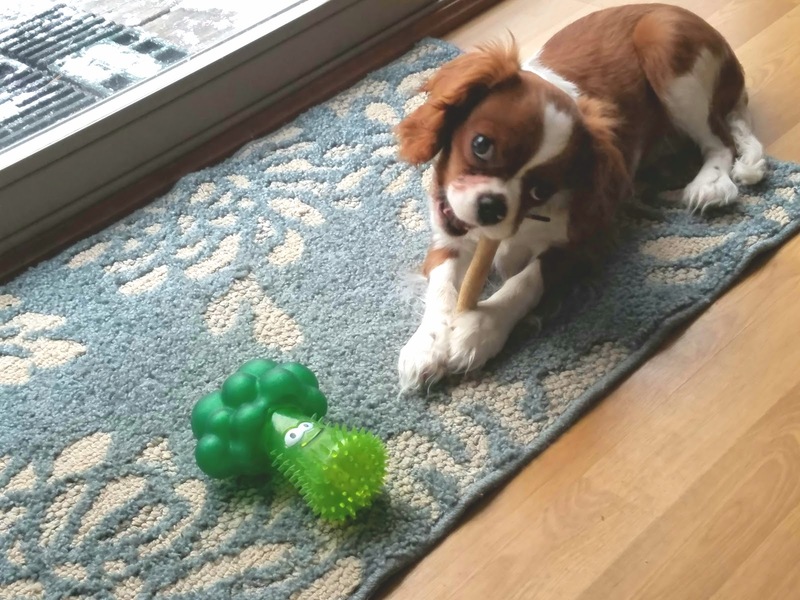 This is Coda, our little Cavalier Spaniel. She has brought so much joy to our lives since we got her last fall. She has changed the way I bird and I often take her on birding expeditions with me. Cavaliers are bred to be companion dogs and this is proving true. She does not like to be left alone. She always wants to be with you and preferably touching you at all times. However, she is definitely a bird dog, because she likes to eat bird seed and chase the turkeys out of the yard. Of course, she cannot get them, but it is fun to watch. 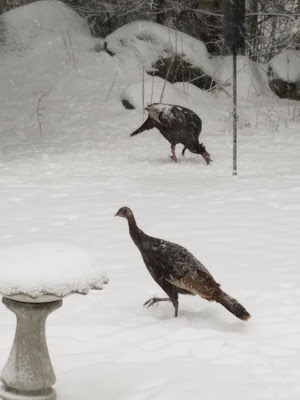 And before anyone gets upset about the birds, let me just tell you that a flock of 10 to 20 turkeys can do a lot of damage to your yard and they leave behind droppings the size of golf balls! Plus, this is much better than the former owner of this house, who used to shoot them! I saw my first American Tree Sparrow here on December 17th. It hung around for a couple of weeks, then disappeared for all of January. On February 1st it showed back up again, and has been here sporadically ever since, but only just 1. I have never seen more than one in this yard...yet. 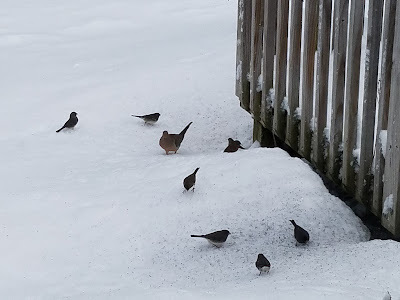 I look forward to the return of the spring birds and I continue to hone my birding skills. Recently I won an online contest through eBird to a Raptor Course through their Bird Academy. I was one of 10 people selected for submitting at least one eligible checklist during December. 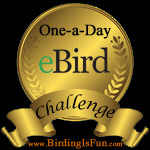 I have submitted over 12,000 checklists since I first started eBirding back in January of 2008. I do it because I love it, but it was nice to finally win something. 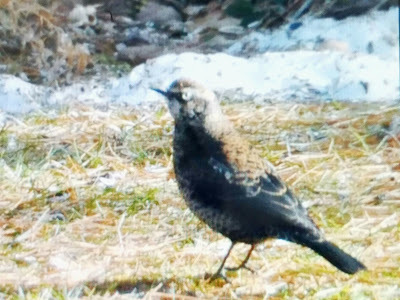 Anyone can become an eBirder. Just click on the links to find out more. 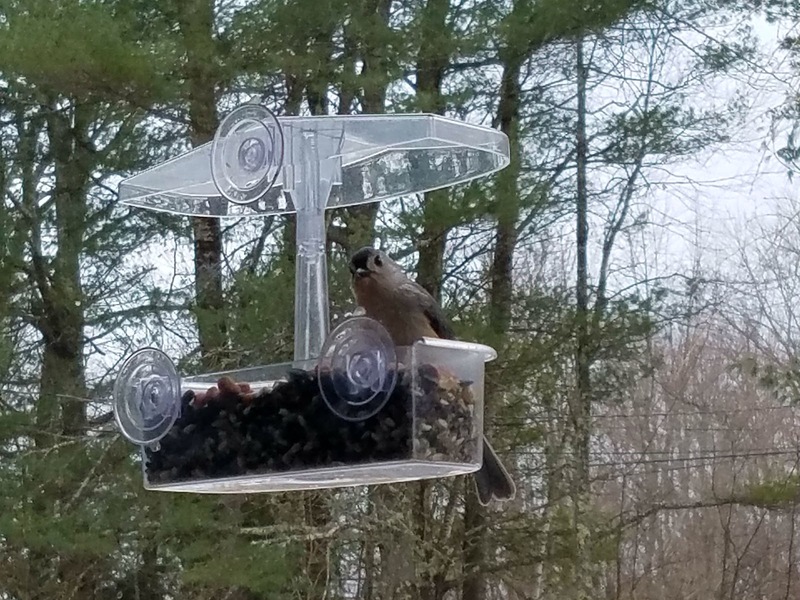 Xanthochromic Evening Grosbeak in Northern Maine?